It’s the sesquicentennial of a then-sensational, now-forgotten hanging in Rochester, N.Y.
At dawn on December 20, 1857, the city had awoken to the discovery of a mangled corpse by the Genesee River’s High Falls … and more than enough evidence to have the corpse’s killers in hand by tea time. Marion Ira Stout — he just went by Ira — had made a dog’s breakfast of the job, according to History of Rochester and Monroe County New York from the Earliest Historic Times to the Beginning of 1907. [W]hen they got near the edge of the bank, Ira struck his victim a sudden blow with an iron mallet, smashing the skull and producing death instantly. Stout then threw the body over the precipice, supposing that it would fall into the river and be swept into the lake before sunrise, but instead of that it landed on a projecting ledge thirty feet below the upper level. Perceiving that there had been some failure in the matter, Ira started to go down a narrow path that led sideways along the cliff, but in the darkness he missed his footing and fell headlong, breaking his left arm in the descent and landing beside the corpse. Summoning all his remaining strength he was just able to push the body over the bank, when he sank in a dead faint. On recovering from which in a few minutes, he called to his sister, who was still above, to come and help him. When she started to do so, the bushes to which she clung gave way; she stumbled, broke her left wrist, and fell beside her prostrate brother. But it would not do to remain there, wretched as was their plight. So, after searching in vain for Ira’s spectacles, which they had to leave behind them, but taking with them the fatal mallet, they scrambled slowly and painfully up the bank and made their way laboriously to their home on Monroe Street. In lieu of a last statement, Stout referred his audience to this writing, which was published posthumously. Courtesy of the New York State Historical Association Library, Cooperstown, N.Y.
Sure enough, the glasses were waiting near the victim for the cops to find come daylight. 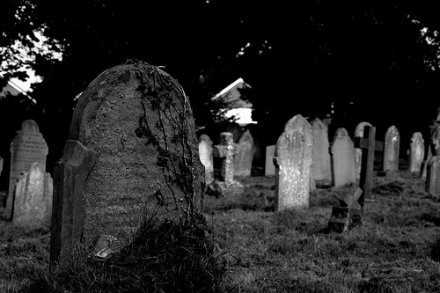 How did Ira, his sister, and the late Charles Littles — the sister’s husband — find themselves in this macabre dance? That’s the murky bit, though it’s fair to say there was some negative energy in the family. Littles was a violent, jealous, philandering drunk. His wife Sarah seems like the classic abused spouse. Ira was an ex-con who seemingly had his life back together. Oh, and Ira and Sarah were sleeping together — professedly true in the literal sense (they were observed to sleep in bed together in their underthings), and possibly true in the Biblical sense. Still, the condemned charmer garnered sympathy for having saved his sister from an abusive marriage; Susan B. Anthony and Frederick Douglass rallied to his defense, and a female admirer smuggled him poison to cheat the hangman … which said admirer managed to end up ingesting herself, and barely survived. Death got all ten-thumbed around Ira Stout, it seems. His hanging was no different. The gallows is the same which has always been in use in the jail — the rope, a hempen cord, alone being new. A weight of 186 pounds rests upon a swing door set in the garret floor of the jail. From this weight, the rope runs over two pulleys above, and the end of it drops through two doors, and nearly to the main floor of the jail. The weight falls about eight feet, jerking the slack end that distance. The halter attached to the main rope is a long distance below the main enginery of death, and the latter is not seen by the spectators or prisoner. The Sheriff stood at the foot of the stairs, some forty feet from the prisoner, and by a small cord pulled the latch which let the fatal weight fall. But since this is Ira Stout, you know it didn’t come off without a hitch. The death of the ill-fated man was not as sudden as could be desired. His struggles for eight or ten minutes were severe, and caused the spectators to turn away in disgust. His neck was probably not dislocated, and he died by a slow process of strangulation. Doctors Hall, Avery, James and Miller stood near, and in eight minutes after the drop fell they said his pulse was as full as in life. According to a feature story in the newsletter of Mount Hope Cemetery where Ira Stout takes his eternal rest, he might have tried to hang on quite a bit longer. A rumor was current last night at a late hour that Stout was not dead, and that efforts were being made to resuscitate him by the use of galvanic batteries and other means sometimes employed for the restoration of persons supposed to be dead. How much truth there is in the rumors thus made we cannot say, as we have not taken pains to inquire at the house of Mrs. Stout. No surprise, that didn’t work either. It is Thermidor — Month of Heat — by that queer artifact of the times, the Revolutionary calendar, and in the blistering summer the guillotine rots its own scaffold. It is the climax of that emblematic moment of the French Revolution, often wrongly standing to casual observation as synonymous with the entire revolution. Jarring indeed how brief the span of those pregnant, dangerous days, that upon the storming of the Bastille the guillotine had not yet been erected and from that traditional birthdate of the Revolution were eclipsed successively the Bourbon monarchy, the Constitutionalist Assembly, the Girondin liberals, Marat, Danton … culminating in the bloody hegemony of Robespierre and the fatal test between the Jacobins and their enemies. 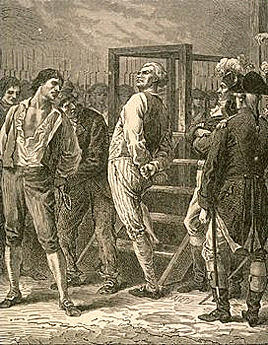 By the spring and summer of 1794, Paris is delivered fully to Robespierre. “Terror,” he says, “is only justice prompt, severe and inflexible; it is then an emanation of virtue; it is less a distinct principle than a natural consequence of the general principle of democracy, applied to the most pressing wants of the country.” A blip on the screen chronologically, this period seems endless to those who survive it, and it reverberates endlessly to those who succeed it. 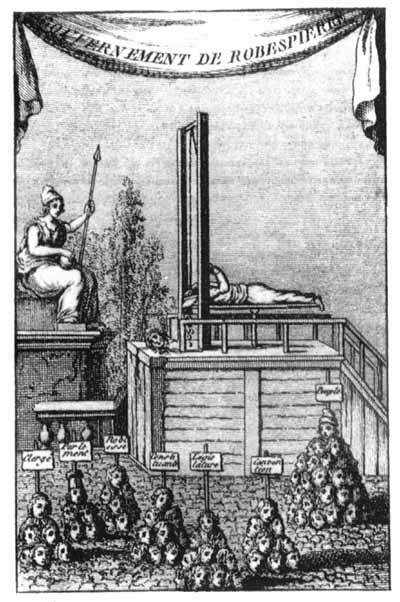 In this Revolution-era cartoon, legendary Parisian headsman Sanson, having run out of victims, guillotines himself. For the next week, join Executed Today in 1794’s Month of Heat as day by day the Terror rages at its apex, inscrutably suffering citizens to live or die — until of a sudden it succumbs to its own rot.